Despite some modest success with ‘80’s hard rock outfit Actor (who only managed to release a self titled E.P. in 1983) and L.A. based act Fire some years later (a band that drew some considerable attention, but failed to record anything beyond a demo), vocalist Jessie Galante is virtually unknown to most. But while her past endeavours may have been misfires, there’s no mistaking the guaranteed firepower of her second solo release Spitfire (the follow up to her debut solo effort Gesua from 1997). 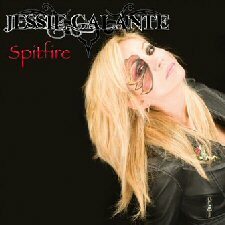 Although it’s taken a number of years for Galante to make her long awaited return to the music scene, Spitfire is a remarkable comeback effort from what her hometown love referring to her as Buffalo’s original first lady of rock. Spitfire is quite a diverse effort, and one that amply covers off of Galante’s wide array of influences, which include elements of soul, rock and a touch of the blues. But while many come across as a bit of mess in terms of direction, Galante manages to give Spitfire enough consistency to showcase her impressive vocal prowess to keep the album from falling into a mess that simply covers too much ground without achieving its true objective. The opening title track Spitfire is a funky hard rocking opener that pits huge sounding guitar riffs against Galante’s soaring soulful vocals (which impressively enough really do manage to cover a considerable range), while I Crave It and her cover of Sass Jordan’s High Road Easy may show a slight change in pace and tempo, but more than manages to maintain the rocking energetic vibe of the opener with considerable ease. The easy going groove of Go on Rain on Me is quite infectious and easy on the ear and has the potential to do well as a single, while Can’t Find My Baby manages to evoke the same measure of success, but with a little more grunt on the guitar region and a whole lot more attitude on the vocal front. The reworked Gladys Knight & The Pips cover I’ve Got to Use My Imagination seems tailor-made for Galante with its mix of hard rock and genuine soul, while that same mix of soul with a distinct hard rock vibe is carried through to the biting Get Away and the driving Grown Man Cry. In a complete change of pace, Galante puts in a powerful performance on the soulful No Fool No More, before closing out with her best Tina Turner impression on Mamma (I Get a Little Crazy). It really comes as no surprise to find that much of Galante’s success has come from Europe than it has done in her native U.S. The European market is so much more open to diversity, while the U.S. like their artists pigeonholed. Spitfire is one diverse album, and one that I feel will have its limitations in the U.S. given its broad array of influences and sounds. But given her previous success, I can’t help but feel that the album is sure to make an immediate impact everywhere else. In short terms, Spitfire is one rocking release.